Engineers can more quickly design, build and commission automation systems using the newly enhanced Rockwell Software Studio 5000 integrated development environment. The latest software release includes a new user interface that provides a common, modern look across all Studio 5000 applications, and includes updates to help engineers improve productivity from design to deployment. The Studio 5000 Logix Designer application now includes updates to several programming languages and a modernised structured text editor to help optimise design time. The text editor has been updated with many new features, such as collapsible code segments and inline value monitoring, for more productive programming and editing. The new Logix tag-based alarm functionality allows engineers to easily add alarms to structures and manage them in a single environment, which helps save time by avoiding the need for programming. The update also includes new drive safety instructions in accordance with IEC 61800-5-2, and motion instructions for expanded kinematic support. In addition, the modern user interface includes multi-monitor support and tabbed views to help improve usability and reduce design time. The Studio 5000 Logix Designer application also includes support for the new Allen-Bradley GuardLogix 5580 and Compact GuardLogix 5380 controllers. This provides new high-performance options for users as they design safety systems and can help reduce overall machine costs. The Studio 5000 View Designer application now includes data logging and trending for easier troubleshooting. And it gives engineers access to emulation capabilities for virtual commissioning and testing applications to help reduce system development time and risk. The Studio 5000 Architect application supports systemwide capabilities that can reduce design complexity and time. For example, the updated version has adopted the open data-exchange interface, AutomationML (Automation Markup Language), for expanded connectivity and robust data sharing between the Studio 5000 software and other engineering tools such as EPLAN Electric P8. A new Studio 5000 Application Code Manager lite edition is available for download as a single-user edition for machine and equipment builders who operate on a smaller scale. At no added cost, this version will contain bulk-programming and library-management capabilities, with a standard version available as an annual subscription. 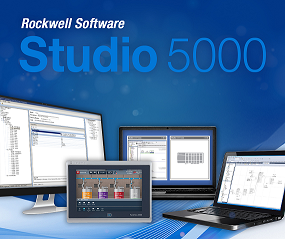 In addition, to help jumpstart development, Rockwell Automation now provides a Machine Builder Library and Process Object Library for Studio 5000 Application Code Manager. Both libraries can be downloaded from the Product Compatibility Download Center (PCDC) for no additional cost. The Studio 5000 Logix Emulate application now has an updated interface for connectivity to operator training systems like Cape Software VP Link and MYNAH Mimic, along with an improved user interface.